Everyone is finally feeling fine today and I was so excited to get back on track. Unfortunately, I seemed to be the only one excited about that. 8 o'clock came and our school day began. I was heckled by my middle child as I read through the book Telling Time by Jules Older to the point I just sopped reading part way through and handed them the clock game I had planned for today. I found this really neat game called Time's up! where the kids each race to be the one to cover up all their clocks first. It requires matching digital times to analog times and I thought it would be fun but Alec just threw his game board back at me and said he didn't know how to tell time. I just turned and walked away. Call it a sanity day or whatever you want but I knew I just had to stop teaching/ trying for today. We'll try again on Monday I guess. It seems like every time we take a leap forward and I see how wonderful and right homeschooling is for us, we then take a giant step backward and I wonder if I'm really doing the right thing. Hearing Ian tell me he loves to read was a nice leap forward, listening to the complaining and seeing yet another school day opportunity pass us by is taking a giant step back. But as I was reminded this morning, life is a journey not a race. Behind or ahead does not matter in the end. As a teacher, by profession, I tend to worry A LOT about my kids being behind or ahead of their peers. I want to find that happy medium where we're working at the right pace, but I think that might just be impossible. As I sit here typing out my frustrations about our day I look back and realize that all of my kids did all their school work for the day. Not the work I had planned (and that's OK) but work none the less. Ian un- molded his volcano, painted it, and waited rather anxiously for it to dry so he could erupt it. He finally got to erupt it twice and was so excited. Ian asked me for the use of the computer so he could finish his art project and he drew the rest of his snow covered town. I found him reading his Diary of the Wimpy Kid book and he watched a Wild Kratts video about animal food chains and a Where in the World is Carmen San Diego video that he claims taught him about geography. He then asked if he could just do a page in his McRuffy book since Alec still didn't want to play the clock game. I obviously agreed to that and Ian found a page all about clocks that he worked on. By this time he had also cleaned his room, put away his laundry, and made lunch for himself and his youngest brother. It was quite apparent that he didn't want to end up back in public school. I was so proud of how well he took control of his own learning and all his chores. It gives me hope that his younger two brothers will be that way someday too. After crying most of the morning, Evan settled down after lunch to work on a dot- to- dot alphabet worksheet and tried once again to read the book Pat's Cats to me. We had tons of books waiting for us to pick up at the library and all of the boys read books on the way home. Once Alec had lost himself in his new book for a while, he then wanted a turn erupting Ian's volcano, but Ian didn't want him to use it. I reminded Alec he had the same kit and so he worked on putting his own volcano together. He followed the directions and made it by himself, even cleaning up after himself. I then reminded him he had to do some math before he could join his brothers watching movies. After much debate he decided it was just easier to do a lesson in McRuffy too. Ian ended up opening up his snap circuits kit that he got for Christmas and learned how to attach them to the battery in a positive/ negative circle of unbroken circuits to make a small light bulb light up and also to turn a small propeller. He occasionally consulted the instructions when he got stuck, but for the most part used trial and error to get them to work. In the end we ended up having a full day of learning and activities and I guess that's all that matters. Every journey has a few bumps in the road and I just have to know that in the end we always find our way. Yes! I try to focus on the fact that they are learning even when it's nothing I had planned on teaching. It always amazes me how much learning really happens even on those days when I think no one is doing anything! Always love reading your perspective - thanks for sharing! Wow, really the most perfect post for me to read today! We have had a rough day around here. I keep trying to find a system that will have Matthew learning, without complaining! I am thinking that it is just a loss, and I will have to deal with it a different way. Feeling like I am really at my whits end! But days like today are thankfully not an everyday occurance. And he really did get his work done, but it was a struggle. Now he picked up some better attitude and has done 3 lessons of language. Some days I think they just like to drive us crazy! Thank you so much for the encouragement and helping me to make sure that I look outside of the box for what he is learning and doing. Some day I really think they do enjoy driving us crazy! Glad this helped encourage you. I have found that some days my kids happily sit down and get all their work done and other days it is like pulling teeth to do even the most basic of assignments. I have learned I just have to go with it and I do try to back off a bit on tough days or give them some alternate choices; my boys mostly balk when it comes to writing so on tough days I might tell them they can try copywork or play a language arts game instead. I'm always pretty amazed by your posts. Your go with the flow and trust in learning despite not following the plan for the day is refreshing. Yet still foreign to my more structured mind. I marvel at your children's ability to still accomplish so much without directing. I know this had to come from your guidance. :) I guess my point is, I love your posts and getting a peek into your homeschool life and your perspective. 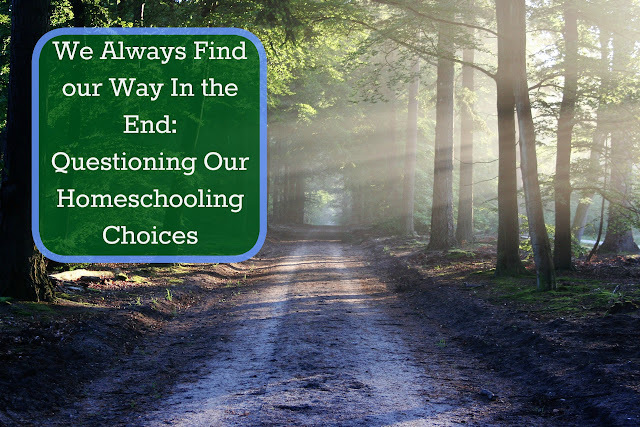 I tell myself often that as I get more experienced with homeschooling I will relax more with the lesson plans. Is there hope for me? Lol! To get a good laugh...my daughter is in Kindergarten. We do fun things, but I still try to complete the curriculum lessons first. Usually it does drive me nuts as it feels to be spiraling out of control but I have learned that some of what felt like huge days of failure were really filled with learning but I had to train myself to really watch, listen, and trust. I know my first few years of homechooling (and even now!) my first inclination is to try and replicate school at home but my boys keep reminding me that it just doesn't work for us. We need a balance somewhere in the middle where we are all happy.